Learn all the tips, tricks and techniques you need in order to paint beautiful scenes of boats and harbours in this inspiring and practical book. 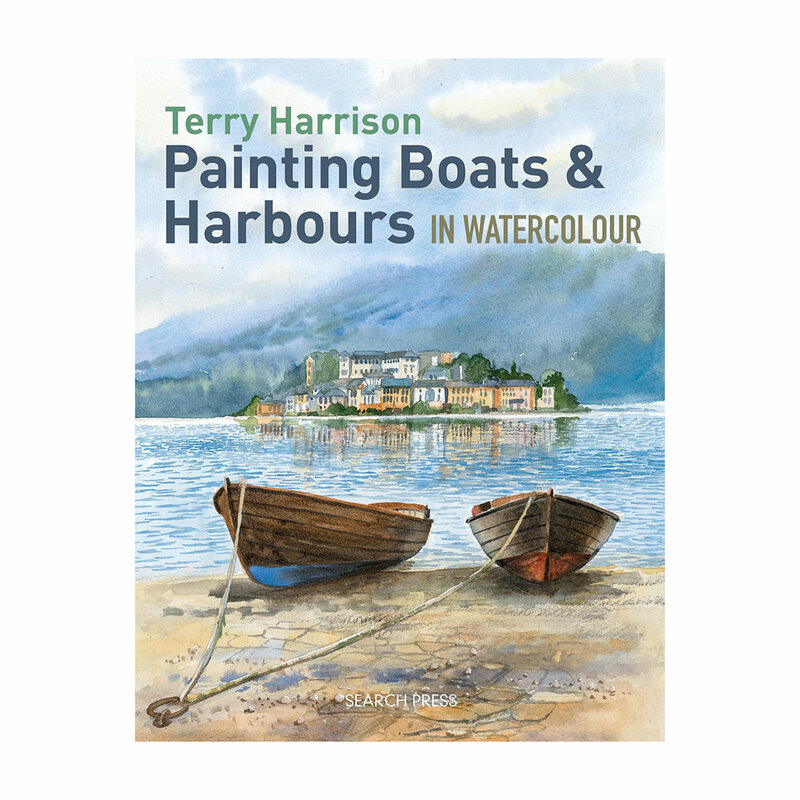 Terry Harrison explains that you don't need to be an expert on all things nautical to paint great boats and harbours, you just need to learn to paint what you see using the advice and exercises in this book. There is excellent advice on using photographs, painting reflections, rigging, sails, jetties and harbour walls, as well as boatyard clutter, beaches, estuaries, figures and all the varied moods of the sea. There are then 6 beautiful step-by-step projects including a tall ship at sea, Greek boats by a sunlit jetty, a river harbour, a sparkling lake, a ship at sunset and a harbour village. 'You don't need to know how a boat is made of indeed how to sail it, to be able to paint it.' Terry's introduction sums up a simple guide that doesn't go into a lot of technical details or get bogged down in the intricacies of rigging. s you'd expect from an author whose clear explanations have won him many friends, this is a book that dispenses with the unnecessary and concentrates on the subject in hand. From basic shapes to simple sails and onwards via waterside structures and the facets of water, Terry builds up a comprehensive guide to painting maritime subjects. Progress is steady and the subjects straightforward, making this the perfect introduction. If boats are something you're new to or find difficult, this one is a winner - Henry Malt. Boats make wonderful subjects for artists and in his latest book, Painting Boats and Harbours in Watercolour, Terry Harrison shows you how to set about painting them in all shapes and sizes. Opening chapters cover the materials you will need plus basic colour mixes for those colours you will be mixing time and time again - rusty paint work (a mix of burnt sienna, burnt umber and cobalt blue), for example; or sails (raw sienna and cobalt blue). Terry shows you how to use photographs as valuable reference tools and ho to transfer the image onto your chosen support. Six step-by-step demonstrations to follow, interspersed with instruction on specific subjects, such as painting rigging using masking fluid, harbour walls, piers and jetties, beaches and estuaries, adding figures sparkling water and the mood of the sea. Boats can be tricky things to paint, but Terry will show you the ropes (literally) and have you painting marine subjects with confidence. This is a straightforward book that forms a nicely progressive course that starts from simple shapes and builds up from smaller crafts to fully-rigged sailing ships. Terry is an excellent teacher and he knows just which steps to include and which to leave out so that his demonstrations are clear and uncluttered. He is able, for instance, to explain water-related colours comprehensively in just two pages and to deal with rigging and sails in another four. At no time will you feel either overwhelmed or left short of information. This is a book filled with hints, tips and demonstrations and will take you right through from the basics to large craft in full sail on a rough sea or a populated harbour scene with several boats and onlookers. As you'd expect from Terry, it's the perfect guide. This straightforward guide is full of Terrys trademark no-nonsense instruction thats made him the popular teacher and demonstrator that he is. It also sticks nicely to its brief and contains almost nothing except the subject matter of the title extraneous details that only serve to complicate the scene and how to paint it are ignored. Even the section on boatyard clutter is arranged so that, while the boatyard may be cluttered, the painting isnt. As a result, apart from a course in maritime subjects, you also get a bit of a masterclass in simplification. After an introduction to aterials, using colour and working from photographs, youre straight into a simple exercise in getting boat shapes right. This is important as craft sit on the water and mistakes here can make them look all-to-ready to capsize. From there, its a simple scene with a small cutter resting in calm waters. This is followed by some reflections and then a few ripples. It all builds up progressively and its not long before youre ready to start tackling rigging. The bulk of the book is a series of demonstrations some of simple subjects like jetties and some more complex, but always building on the skills you have and adding more as you go along. Boats and water dont need to be difficult, as Terry shows, and he blows away a great deal of the mystique that surrounds the subject and he makes it readily accessible in the process. For a self affirmed 'land-lubber' the author shows a passion for the sea. If you're looking for a how-to on painting a variety of boats and sea scenes this is the book for you. I especially like the different techniques to paint water. This isn't a book I've seen before and gives some great techniques for those wanting to complete the ideal nautical scene without having to leave the comfort of your sitting room (reference pictures aside). One for the shelves.